Nicholas Christakis is a Professor of Medicine, Health Care Policy, and Sociology at Harvard University and his work “examines the biological, psychological, sociological, and mathematical rules that govern how we form social networks, and the rules that govern how they shape our lives.” His paper, “Dynamic Spread of Happiness in a Large Social Network,” co-authored with James H. Fowler and published in the British Medical Journal measures the clustering of happiness and unhappiness within social networks. 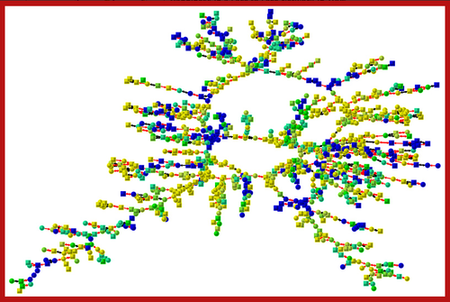 The image below, taken from a 2000 study, is a representation of a social network of 1,020 individuals with yellow nodes denoting happy subjects and blue nodes representing unhappy subjects (shades of green are intermediate). What’s immediately noticeable is that happy and unhappy people tend to be grouped together. The possible reasons for this clustered effect could be the result of induction (one person is directly influencing another), homophily (like-minded people tending to find each other), confounding (people sharing similar circumstances and environments), or any combination of the three. If you are surrounded by happy people, you’re more likely to be happy; if you yourself are happy, those around you are more likely to be happy. This theory, also known as social contagion, has also come under some criticism lately and a detailed explanation is highlighted in this Slate article. It’s hard to conclude that happiness is “catch-able” like the common cold but even without causation the statistical significance of the clustering is pretty powerful. So in my book, all the better reason to make the decision to be happy—it just may help those around you to be happy as well.